Young computer scientists are introduced to basic programming through an engaging, hands-on experience. Using the award-winning Bee-Bot floor robot, children are presented with challenges and program their Bee with directional language. Children collaborate, solve problems, and think critically. Hey, young robotic engineers! Finally, a robotics workshop that encourages creativity, experimentation and engineering for K-2 graders. Robotis is the newest wave of block robotics straight from Korea. Each week students will be challenged to build a new robot using rivets, plates and wheels. The actuator (motor) makes their new creation move on its own. Join the robot revolution with The Robot Factory. Build-it with LEGO is a premier engineering workshop created by the experts at LEGO Education. Children are challenged to build a bridge to reunite two best friends stranded by a river between them, depict a scene from their favorite adventure story, experiment with balance, weights & measures, design their perfect house, and design and play a new strategy game. Hands-on expression of ideas is at the core of this engaging, fun engineering program! Using LEGO® bricks and characters, children will be challenged through creative story prompts to design and engineer their imaginary world. Each activity is designed to offer choice, allowing students to build, model, and share their ideas, thoughts, and stories. Team up with legendary Chemistry Crime detective Sherlock Gnomes to investigate a series of suspicious crimes based on chemistry experiments. Each mission is introduced by Sherlock Gnomes via video with a silly crime scene and ends with our Science Sleuths creating a chemical reaction in the lab. Real science + ridiculous crimes = Lots of learning and laughs. 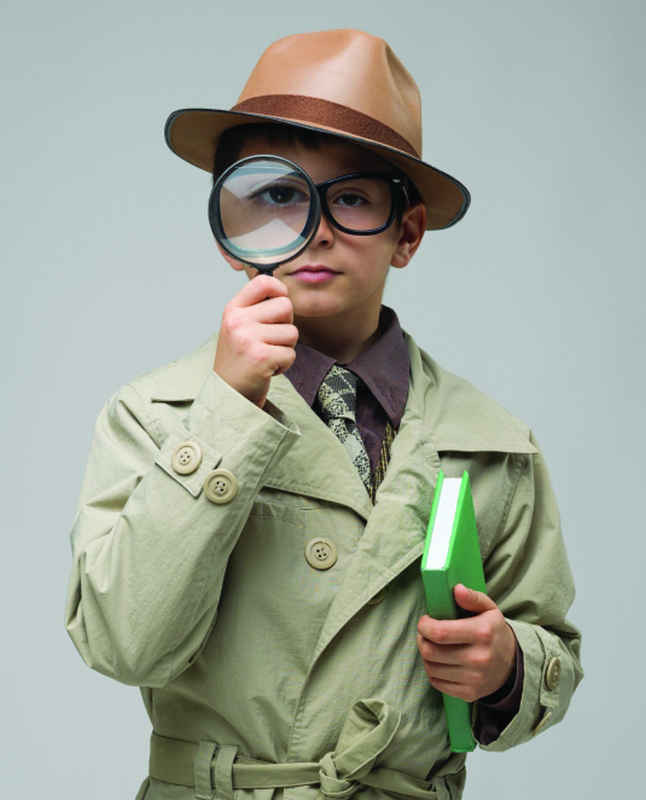 Join our squad of Science Sleuths as they investigate a series of suspicious crimes based on chemistry experiments. Each mission begins with a silly crime scene and ends with our Science Sleuths creating a chemical reaction in the lab. Real science + ridiculous crimes = lots of learning and laughs! Recycle items that would ordinarily be discarded by turning them into toys, sculptures, and household objects. Students will use recycled materials to engineer their own toy cars, then compete in a Recycled Racer Rally. 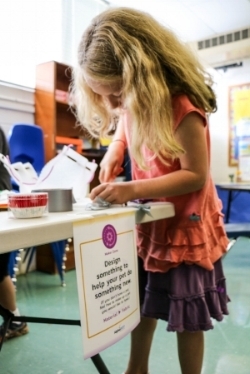 Developed by the Boston Museum of Science, this workshop emphasis the Engineering Design Process throughout the activities, encouraging creative problem-solving and innovation. Future engineers build LEGO® machines, models and robotic creatures while conducting real-world science experiments with motion, force, and energy. Models are brought to life with the addition of motors, gears, generators, and even sustainable energy, like the wind! Welcome to LEGO® Robotics: Safari Edition! On this exciting robotic adventure you will build and program LEGO® robots of incredible wildlife animals. Use Scratch coding technology to make your robotic giraffe eat leaves from a tree! Code a sensor activated frog to jump. Program a lion to stand up and lay down on command. You will even learn how to add sound blocks so that your robot lion can roar! LEGO Robotics: Safari Edition challenges you to bring your animal robots to life with motors, gears, pulleys, sensors and easy-to-learn computer coding. 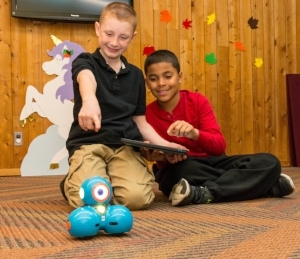 Robot friends Dash & Dot come to life as students program them to move, wink, launch things, and even play the xylophone! Students are introduced to computer programming as they control Dash's movements using simple apps and Blockly programming on an iPad. Ozobot robots are tiny, but powerful! Students love how they follow colored lines, spin, flash lights, and dance. Math and science concepts are explored as students control Ozobot movements by drawing colored lines on paper, using simple apps, or with OzoBlockly, a programming language that snaps together like puzzle pieces. Students will meet Jacob at NASA’s Jet Propulsion Laboratory to learn how to engineer rovers that can be used to explore faraway worlds. Soon after, we visit India at the International Space Station to learn about the trade-offs and variables involved in engineering a rocket. Kids will engineer rockets and rovers to help India and Jacob explore several planets and moons in our solar system. Give your brain the most fun workout ever! Every session is packed with learning and playing the most fun brain games around. This workshop is totally fun and brains! Kids growing up in today’s digital age do not know a world without Instagram, Twitter and YouTube. Making and sharing media is a part of their everyday environment. In this course, students will create their very own DotBots (clay characters) and join fellow animators on an exciting journey of digital storytelling! Along the way, students will learn basic stop-motion animation techniques by following our pro tips and fun animation recipes, turning the youngest learners into Animation Chefs! Welcome to the AlphaBEST engineering lab, where ingenuity and creativity are key. Weekly engineering tasks challenge students to invent, hack, tinker and play their way to creative problem solving. Together, we will create FUN!